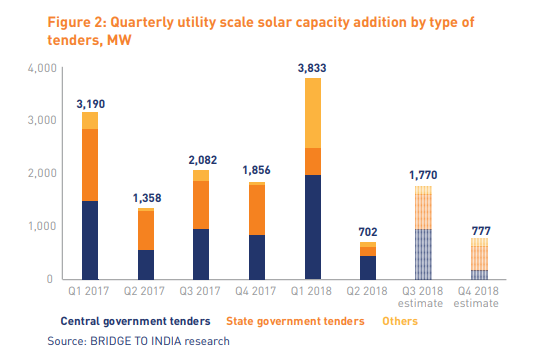 India Solar Compass provides a comprehensive update on the Indian solar market. It includes detailed updates and commentary on tender issuance, auctions, capacity addition, tariff and equipment price movements for the previous quarter as well as outlook over next two quarters. It also includes information on market shares of key players, policy developments, financial deals and key international trends. Q2 saw a significant dip in utility scale solar installations to 702 MW, down 80% over Q1. Nonetheless, the quarter was eventful for a record high in new tender issuances and auctions, increased funding and a sharp fall in module prices. We estimate new capacity addition of 1,770 MW in Q3 and 777 MW in Q4 2018.